This pea omelette makes a big, savoury brunch, lunch or quick supper for one or two. A carb cutters perfect start for the day. Hot Water - 4 Tbsp. Onion Juice (optional) - 1 tsp. Parmesan Cheese - 1 1/2 Tbsp. Garlic Scape Sea Salt - 1/2 - 1 tsp. 2) Combine eggs, hot water, melted butter, 1/2 of spinach chopped, onion juice, parmesan cheese & Garlic Scape Sea Salt. 3) Melt 1 Tbsp of butter in a pan, brown well and put in the egg mixture. Cook over low to medium heat till eggs have set. Cover with a lid if necessary. 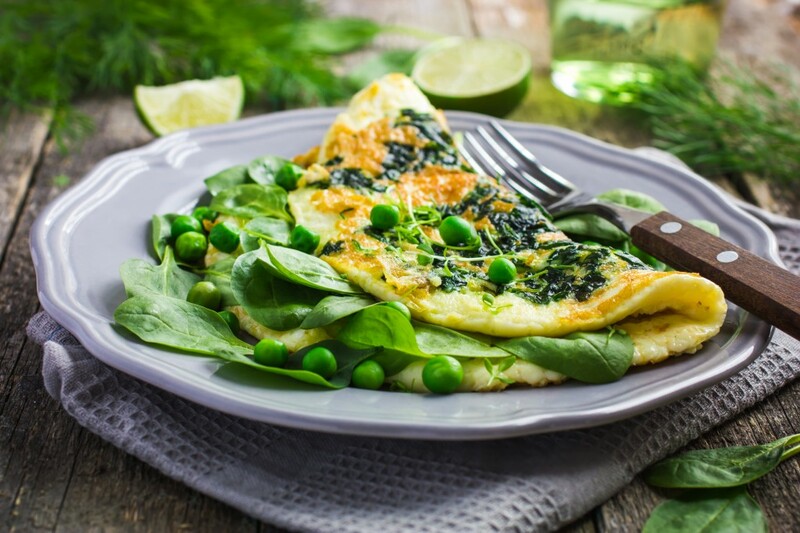 4) Put 2 tablespoons of boiled peas in the middle of the omelette and fresh torn spinach pieces, turn one half of it over the peas and put on a hot dish. Arrange the rest of the peas around the omelette. Add salt and pepper to taste. Serve at once.